We’d love your help. Let us know what’s wrong with this preview of Fill the Sky by Katherine A. Sherbrooke. To ask other readers questions about Fill the Sky, please sign up. Wow, another amazing 2016 debut! From the first page of this one, I was totally hooked. Not only with the story and the characters but the setting of Ecuador. I have some serious wanderlust after all the amazing settings I've been reading lately and this book is right at the top of the list. This book was filled with beautiful descriptions of the landscape, the people, the mood and the feeling of this awe-inspiring country and those descriptions were seamlessly juxtaposed with trying to heal Ellie; this entire book and experience felt so spiritual even with this dark but hopeful cloud hanging over them as the reason for the trip. This novel is about friendships and about accepting past choices while still and always moving forward. It has a bit of forgiveness but something more powerful that I think transcends words -- it's a feeling and I definitely felt it when I was reading Fill the Sky and especially when I finished this book. This book may cause you to think about alternative healing practices and question whether, sometimes, modernity is not always the answer. I loved this book and can't wait for more from this author -- definitely recommend it if you like introspective novels that a re a bit spiritual and off the beaten path! Fill the Sky comes out next week on October 20, 2016, and you can purchase HERE. She drank in the explosion of color on the right side of the road--flowers in pink, purple, gold and orange dotting a huge field, nature resplendent and harmonious. Each flower was a universe of its own, the stalk commanding water from the soil as petals flapped open to accept the sun. She said a brief word of thanks to the universe for all of nature's glories, especially the ancient vine that they would be working with, so revered it was known simply as "the plant," a moniker Joline liked to think marked it as the originator of all other vegetation. Powerful, indeed. 3.5/5 I was immediately drawn to this book because of its Ecuadorian setting. I used to live in the Andes in Ecuador so I was thrilled to have a fun book set there. But as I read little things kept pulling me out of the story- like why would you refer to volcanoes as mountains? Or why would a character need a satellite phone- I lived there 10 years ago and I remember the cell reception to be pretty good. So why not just buy a sim card and put a few dollars on it? And so on. Overall it was a cute 3.5/5 I was immediately drawn to this book because of its Ecuadorian setting. I used to live in the Andes in Ecuador so I was thrilled to have a fun book set there. But as I read little things kept pulling me out of the story- like why would you refer to volcanoes as mountains? Or why would a character need a satellite phone- I lived there 10 years ago and I remember the cell reception to be pretty good. So why not just buy a sim card and put a few dollars on it? And so on. Fill The Sky is a tale about life, love, friendship, and finding yourself. The story is centered around three middle-aged women who take a trip to see traditional healers in Ecuador in order to help their friend who is suffering from cancer. Tess is the hard worker of the trio and since her mother’s death during her teenage years she is so focused on taking care of her family and friends without stopping to take care of her own self. Joline is the adventurous one who is open to trying new things Fill The Sky is a tale about life, love, friendship, and finding yourself. The story is centered around three middle-aged women who take a trip to see traditional healers in Ecuador in order to help their friend who is suffering from cancer. Tess is the hard worker of the trio and since her mother’s death during her teenage years she is so focused on taking care of her family and friends without stopping to take care of her own self. Joline is the adventurous one who is open to trying new things and hopes the business deal she made will help the village community of Otavalo. Ellie, is struggling with her cancer while trying to sort out her own feelings between her husband, and family, and a hidden secret. The trip not only proves to getaway for the three women to escape from their daily lives and catch up with one another, but it’s also a self journey. The book explores how the natural healing rituals help the women to heal their mind, heart, and body. Their time away from home allows them to deeply reflect on their pasts and how they can learn from their mistakes. It also allows them to work on the friendship and tighten their bond. I love books that deal with life’s obstacles and travel, so I was really interested in reading this book. I enjoyed reading about Ecuador’s scenic landscapes and their rich culture. The writing throughout the book was very detailed and it showed that the author did great research into making sure she expressed the cultural aspects of this book appropriately while painting a vivid picture of a country readers might not be too familiar with. Another thing that stood out to me when reading this book is that the secondary characters were just as complex as the main character. They had well-developed backgrounds, and intriguing stories that helped you to understand their character and made them relatable to the reader. If you’re looking for a contemporary novel that deals with life and a bit of soul-searching, I’d recommend Fill The Sky. I loved this novel. I had it in my bookshelf for a couple of years, and only now picked it up. I saw Ms. Sherbrooke speak at a conference in Boston and bought the book because it's premise is similar to what I write. But for some reason I thought it would be badly written, perhaps based on how the Ms. Sherbrooke spoke about it. It's VERY well-written, better than most books out there, and the story explains spiritual matters in a non-preachy way. It's clear that the author knows her stuff about S I loved this novel. I had it in my bookshelf for a couple of years, and only now picked it up. I saw Ms. Sherbrooke speak at a conference in Boston and bought the book because it's premise is similar to what I write. But for some reason I thought it would be badly written, perhaps based on how the Ms. Sherbrooke spoke about it. It's VERY well-written, better than most books out there, and the story explains spiritual matters in a non-preachy way. It's clear that the author knows her stuff about South American indigenous medicine, and although I've never been to Ecuador, I've met shamans from Ecuador and have spent a lot of time in the mountains of Peru. Loved this story of 3 friends who take a trip to Ecuador in a last attempt to help their friend. With nothing to loose and everything to gain, their journey takes them to various healers, each experience beneficial to all 3, they learn things about themselves and each other. Their love and support for each other is amazing and what friendships should be. The ending gives the listener a hope that all works out in the end. Valerie Gilbert is the reason I picked up this book and she didn't disappoint. Again and again she brings the story to life with her marvellous voice and passion and this one is no different. I received a copy of Fill the Sky free through the Goodreads Giveaways program. This book was touching and emotional from start to finish. All three women featured in the book have uniquely crafted stories, interwoven with each other through deep, friendship and relationship connections. I thought this story was both dramatic and heartwarming, and featured a few unexpected twists. I would recommend Fill the Sky to anyone interested in journeys of self-discovery and personal emotional growth. A compelling story, wonderfully crafted. Three strong women at major turning points in their lives go on a spiritual retreat. Through encounters with a series of shamans in the mountains of Ecuador, they each struggle with big questions and blocks in relationships. They continually analyze themselves and their relationships, in a style reminiscent of Margaret Drabble, and each encounter adds another insight and another issue to find a way through. This book was an equal measure of compelling narrative and interesting storyline. I couldn't put the book down. This book opened up my eyes to different healing practices and confirmed the importance of friendship. The story drew me in from the first page. My favorite book of the year. A book for the thinking reader. Makes you wonder how far in distance and out of ones spiritual comfort zone you'd go for a friend facing a hard death. The personal journeys of each of the three women is very well done, and the descriptives of the beauties of Ecuador and her people are inspiring. My copy is audio interpreted by Valerie Gilbert who is simply excellent in the ability to bring life and differentiation to each character. 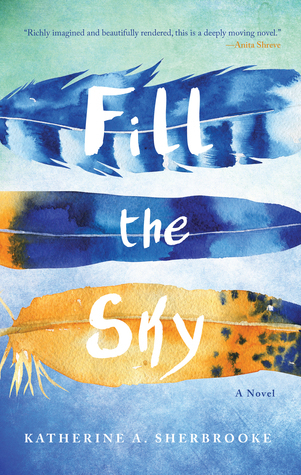 Katherine A. Sherbrooke's first novel, Fill the Sky, is the dynamic story of three friends who travel to Ecuador so one can seek cancer treatment from traditional healers. This sophisticated debut about women's friendships would be a smart pick for a book-loving mom on Mother's Day and makes a great summer read. A most read for anyone going thru a challenging time in life-health related or not. This story will enlighten but uplift you as well. "Fill the Sky" is that rare book that captivates the reader with a beautiful physical backdrop while exploring the complexities of the human condition. I can't wait for this beautiful book to be made into a movie. I am a sucker for a book that dives in t another culture, which this one does with shamans, healing ceremonies, stories of mountain gods and descriptions of the land and the language. Enjoyable read! Fill the Sky is unexpected in so many ways. Four college friends trek to Ecuador in a last-ditch effort to find a cure for their dying friend. Magic and reality criss-cross the story as the friends undergo several shamanistic rituals that force them to grapple with hard choices about their lives. Sherbrooke deftly paints a visual and emotional picture of these four women, taking the reader on the same ups and downs that the characters go through. A truly wonderful, feel-good debut. This book is way out of my wheelhouse as I continue in my efforts to try and stretch my reading muscles. It’s a story about a very strong friendship between three women and the stresses placed on that relationship by several forces; the terminal cancer diagnoses for one of them, the very different personalities they all have, their interpersonal relationships, business problems and as always – love and the challenges it always provides. Tess, Ellie and Joline have been friends for a long time. Te This book is way out of my wheelhouse as I continue in my efforts to try and stretch my reading muscles. It’s a story about a very strong friendship between three women and the stresses placed on that relationship by several forces; the terminal cancer diagnoses for one of them, the very different personalities they all have, their interpersonal relationships, business problems and as always – love and the challenges it always provides. Tess, Ellie and Joline have been friends for a long time. Tess has a need to be in charge and control things. Joline and Ellie are sisters in law – Ellie is married to Joline’s brother. Joline is a free spirit fully believing in the power of the energy of Mother Earth and the Shamans that can harness it. Ellie is suffering from a relapse of her cancer and this time she has been told that there is no hope. There are no more drugs, no more trials that can help. Tess is desperate to find something that will cure her friend – she will try anything. Joline is working to create a place of healing and hope in Ecuador and she puts together a trip for the three of them to meet with some of the Shamans that she knows. Tess is less than convinced that this is going to work but Joline feels it deep inside that this is the answer. Nothing, though is as simple and straightforward as this may seem as each is also dealing with personal problems – even Ellie. The questions for each one will be if they can let it all go and let the energy and positive forces work to heal not just Ellie but the the other two. I must admit that I don’t tend to read relationship books like this but I did, for the most part, find myself enjoying this amazing friendship. I’ve never had one like this and suspect that like with all of those romance novels they really don’t exist quite like this. But nonetheless I found myself enjoying the strong dynamic between these women. Where I lost my interest was when the book veered to far into the world of the Shamans and their “work.” I tend to be a more pragmatic and less spiritual type. But it didn’t detract from the women’s stories for me. The individual stories and the interwoven relationship were all equally developed and made for a page turning read. But all that being written the book ended more with a whisper than a shout. There were questions left hanging; whether this was author intent or there is another book coming I don’t know. This is not the type of book that lends itself to a sequel so I am going to assume the author was leaving us with an ending more true to life as in there are no easy or firm answers. I just don’t know. Satisfactory for everyday life but somewhat less so in a novel. Loved this book! Wonderful descriptive style that painted each scene in my mind as I read. Just ordered Katherine's first book; can't wait to get it. Look forward to more books to come. A new favorite author. Thank you Katherine. Fill the Sky is a totally engaging novel that also encourages readers to think and feel in new and refreshing ways. It’s a tale of Big Pharma vs. ancestral medicine, facts vs. intuition, mind vs. heart, action vs. being, and above all, the healing power of love. We journey to Ecuador with Ellie, who is left without any hope of recovering from cancer by the medical establishment, and the two friends who accompany her for shamanic healing, which seems like her last option. We read Fill the Sky for our Book Group, which turned out to be an excellent choice for discussion. The three main characters, college friends now in their midlives, travel to Ecuador on a healing trip. Having never been to Ecuador or visited with a Shaman (or even thought about it), I lost myself in the experience of traveling to this foreign country. Along the lines of reading a Peter Mayle book, it made me want to plan a trip just like the one the characters take in Fill the Sky to experience We read Fill the Sky for our Book Group, which turned out to be an excellent choice for discussion. The three main characters, college friends now in their midlives, travel to Ecuador on a healing trip. Having never been to Ecuador or visited with a Shaman (or even thought about it), I lost myself in the experience of traveling to this foreign country. Along the lines of reading a Peter Mayle book, it made me want to plan a trip just like the one the characters take in Fill the Sky to experience the food, the mountains and the people. I did not want to put this book down and carried it with me everywhere in hopes of having reading time. The writing makes the three main characters feel so real and familiar, like friends I could already know. The idea of how positive thought and healing the body and mind by administering to the spirit, chronicled for these three women (even though one goes very skeptically), is an idea that while not completely new to me, has been renewed, strengthened and continues to influence my thoughts weeks after reading the book. This is a page turner. Right away I was taken into a world that is very familiar and could relate with while also very different and incredibly engaging. Sherbrooke does an eloquent job of teasing us with seeds of intrigue that unfold in a well-defined, vivid and delicious way. I didn't want chapters to end and yet she gives us just enough to let our minds create the rest of the plot. While it being a wonderful read, I also gained and was reminded of many important lessons including ones around This is a page turner. Right away I was taken into a world that is very familiar and could relate with while also very different and incredibly engaging. Sherbrooke does an eloquent job of teasing us with seeds of intrigue that unfold in a well-defined, vivid and delicious way. I didn't want chapters to end and yet she gives us just enough to let our minds create the rest of the plot. While it being a wonderful read, I also gained and was reminded of many important lessons including ones around control and surrender, balancing and making sense of science and unknown as well as the reality of business results and sorting through personal implications and our decision making processes in very tender and trying times. Perfect. Sherbrooke's characters were extremely relatable. By the end of the books they felt like women I had known for years. The setting was as important as the charters themselves, and without the physical journey to Ecuador, the emotional and spiritual journeys they all took could not have happened. Sherbrooke does a great job of showing how the women transcend their differences to help each other even more than they had originally set out to do. The innate power of women to nurture and heal Perfect. Sherbrooke's characters were extremely relatable. By the end of the books they felt like women I had known for years. The setting was as important as the charters themselves, and without the physical journey to Ecuador, the emotional and spiritual journeys they all took could not have happened. Sherbrooke does a great job of showing how the women transcend their differences to help each other even more than they had originally set out to do. The innate power of women to nurture and heal those around them as well as themselves is brought to light and explored. The story is well written and very readable -- a fantastic book club choice.